At the outset, he is an individual with sharp business acumen and a foundational background in Finance with Morgan Stanley in London. Joining the financial markets before the great financial crisis in 2008, Prashanth has witnessed the limitations of centralized banks first-hand. According to Prashanth, cryptocurrencies have a great future to operate as a parallel economy. He firmly believes that the crypto sector will find a means to coexist with the ongoing economic system. The main rationale why regulators and governments are not liberal towards cryptocurrencies is due to the fact that trading in them lies in the grey area of legality, involving high risk, and lack of understanding of these markets can prove detrimental to the masses. These can only be achieved when the exchange follows legal compliance under the jurisdiction of regulatory bodies. Thus, assuring the users that the trade activities taking place on the exchange are conducted in a fair manner. Embarking on this mission, XDAT strictly adheres to high standards of compliance in accordance with the Maltese government. The reason XDAT adopts such a conservative and cautious approach is to ensure that its investors are well protected. With such a secure, easy and transparent platform for cryptocurrencies XDAT aims to inculcate widespread adoption and encouraging penetration across all segments. Prashanth has put together a powerful team with skilled professionals from different industries such as FMCG, traditional financial services, technology, and accounting. 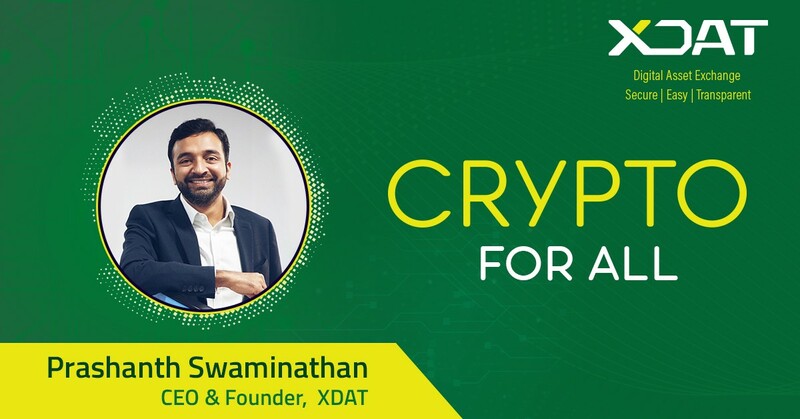 With a strong foundation in the financial sector, XDAT aims to instil a wave of change that brings conventional wisdom and know-how into this emerging space. Keeping a long term approach in mind, XDAT envisions to provide maximum functionality by bridging the ‘divide’ between the finance and the crypto world. XDAT’s ambition is to be categorised as a global brand that is trustworthy and reliable. We at XDAT, are ready to take on the world and leave a lasting impression on the crypto — exchanges landscape.